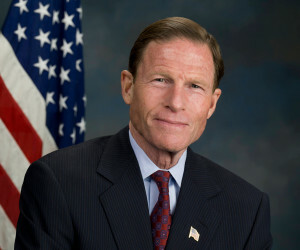 U.S. Sen. Richard Blumenthal, D-Conn., who recently made headlines for urging the Department of Justice to investigate auto insurer collision repair practices, is planning to raise the topic at a media event Saturday, his office said. The event will be held at Wallingford, Conn.-based A&R Body Specialty and Collision Works, which is owned by Auto Body Association of Connecticut President Tony Ferraiolo. It is scheduled for 1 p.m. Saturday. Blumenthals letter calls for investigations into the use of aftermarket and recycled parts by insurers, the alleged practice of “steering” policyholders to certain shops, and whether the 1963 Consent Decree between the government and insurers still applies — particularly as it relates to complaints auto shops have today about insurers. “Consumers and auto repairers possibly remain victims of the very same misconduct insurers were directed to stop doing decades ago,” wrote Blumenthal, who was recently featured in the controversial “Anderson Cooper 360″ report challenging insurers for allegedly mandating shoddy parts to save money. He sought a similar investigation in 2009 when he was the attorney general of Connecticut. The Department of Justice has not returned a request for comment on Blumenthal’s 2015 letter. An effort by former Auto Body Association of America President Lou Baffa to get the Justice Department to review the decree resulted in the government finding no antitrust issues, according to a 2000 piece published in BodyShop Business and commissioned by the Committee for the Consent Decree. However, the body shops suing insurers in that case were given the chance to refile a new complaint, and their new version from earlier this month further connects the dots between modern insurers to those in 1963. The agreement was between the Association of Casualty and Surety Companies, American Mutual Insurance Alliance and the National Association of Mutual Casualty Companies. The plaintiffs in A&E observed that the Association of Casualty and Surety Companies was absorbed into the present-day American Insurance Association in a 1964 merger. The American Mutual Insurance Alliance became the Alliance of American Insurers in 1977, which then merged into what is now the Property Casualty Insurers Association of America. “All but a few” of the defendants in the Florida case are part of these groups, the body shops wrote — though powerhouse State Farm is notably absent in the subsequent examples given of defendants who ought to have known about the case. “As such, it can only be said that Defendants were fully aware their actions, plans, programs, and combinations and/or conspiracy to effectuate the same have been willful, intentional and conducted with complete and reckless disregard for the rights of the Plaintiffs,” the body shops wrote in their new A&E complaint.